Post-WW II US-orchestrated new world order transformed sovereign Western European countries into virtual US colonies. Their status remains unchanged today, their sovereign independence more myth than reality – serving Washington’s geopolitical interests, even when harming their own. Since the Trump regime’s May 8 withdrawal from the JCPOA, followed by multiple rounds of stiff illegal sanctions on Iran, lofty EU rhetoric hasn’t been followed by firm policy decisions, strongly supported by all member states, denouncing US actions, refusing to go along with them. It’s how the EU virtually always operates, yielding its sovereignty to a higher power headquartered in Washington, the shame of all member states. They’re allied with endless illegal US wars of aggression, preemptively smashing one country after another, seeking dominance of planet earth, its member states, resources, and populations. US temporary waivers granted to 10 nations lets them continue buying Iranian energy until next May – EU states not included among countries exempted from observing US sanctions on Iranian oil and gas. Fearing US punitive measures against them isn’t good enough. If major EU nations Britain, France, Germany and others refuse to go along with hostile US actions against Iran or any other countries, Washington is powerless to do anything about it. EU/NATO nations are its most important allies. Punishing them for failure to obey its will would weaken US control over them – something even Trump regime hardliners aren’t likely to risk. The way to counter US hegemonic aims is by refusal of key nations to go along with policies harming their own interests – clearly the case with US sanctions on Iran, Russia and other countries. So far, Brussels and EU member states lack backbone enough to challenge Washington. As long as its subservience continues, the bloc will be allied with Washington against Iran. The bloc won’t be cowed by US threats. Its months of stalling tactics indicate otherwise. It’s up to Russia, China, India, and other nations to lead in refusing to go along with US interests harming their own. 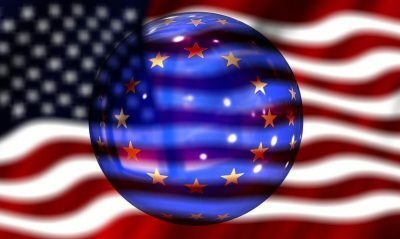 Until and unless proved otherwise, EU/NATO nations are US vassal states, obeying orders from Washington, abandoning their own sovereign rights – the way it’s been post WW II.